On 14 to 16 May 2014, Sweden hosted the 7th GFMD Forum Meeting in Stockholm with the overarching theme “Unlocking the potential of migration for inclusive development.” The meeting which gathered some 900 delegates from over 140 countries and 30 international organizations kicked off on 14 May with a grand opening ceremony. Swedish Minister for Migration Tobias Billström and Swedish Minister from International Development Cooperation Hillevi Engström, gave welcome remarks while H.R.H. Crown Princess Victoria of Sweden and Swedish Prime Minister Fredrik Reinfeldt delivered inspiring opening speeches. During the opening session, the United Nations Secretary General (UNSG), Mr. Ban Ki-moon, delivered a key note message to all delegates representing a wide range of civil society organisations, the private sector, international organisations and governments, including Ministries and Departments of Immigration, Development, Labour, Foreign Affairs, Gender Equality, Justice, Integration and Nationals Abroad. The UNSG called on all countries to rally around the common goals of protecting human rights, lowering the costs of migration, ending exploitation, helping stranded migrants, raising public awareness, integrating migration into the development agenda, gathering more reliable data, and enhancing partnerships. He enunciated that migration should be a journey of hope, not a perilous gamble in which migrants and their family members risk their lives and livelihoods. Mr. Mevlüt ÇAVUŞOĞLU, Minister for EU Affairs of the Republic of Turkey, shared some perspectives from the incoming GFMD Chair Turkey, while Ms. Michele LeVoy, reported on the outcomes of the GFMD 2013-2014 Civil Society Days held 12 and 13 May 2014. With the central theme, “Partnering to realise the potential of migrants and migration for inclusive development,” the GFMD 2014 Common Space witnessed further trust-building and frank discussions between governments, civil society and international organizations. Chaired by Mr. Peter Sutherland, UN Special Representative of the Secretary General (SRSG) for International Migration and Development, the GFMD 2014 Common Space (CS) began in plenary with a very enlightening presentation by Professor Hans Rosling. Three simultaneous CS sessions then ensued, focusing on the issues of migration in the post-2015 development agenda, decent labour migration and employment, and migrants’ empowerment for social inclusion and human development. The conclusions of the break-out sessions were then reported in plenary by the CS session moderators. 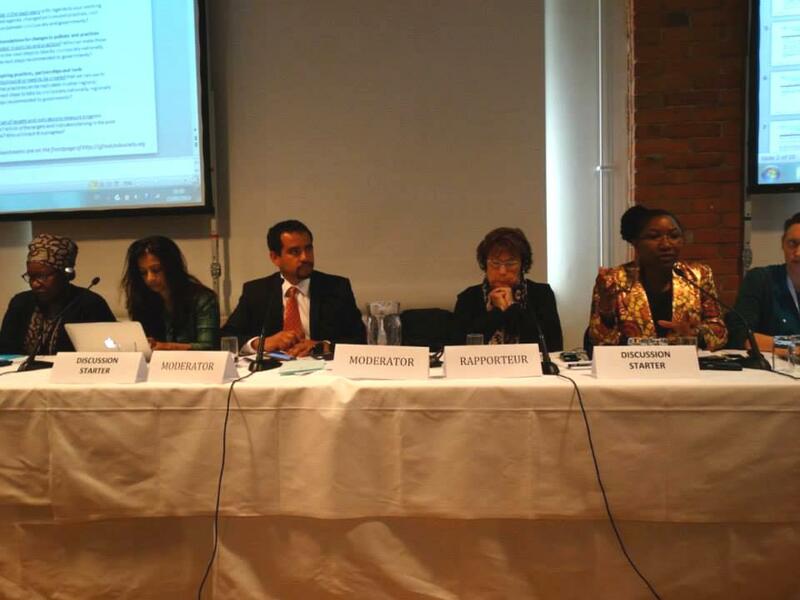 Three successive rounds of Roundtable discussions and Special Sesssions (on the Future of the Forum and the GFMD Platform for Partnerships) were organized from 15 to 16 May. 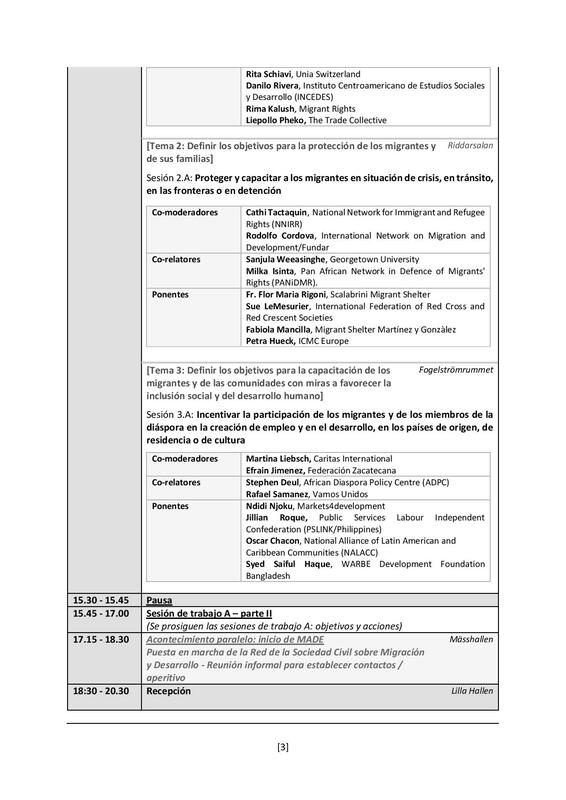 Each day rolled out with a brief plenary session led by Ambassador Eva Åkerman Börje, together with special guests from the European Union and the Global Migration Group, respectively. Ambassador Åkerman Börje chaired all preparatory meetings of GFMD 2013-2014 in Geneva and represented Sweden as Chair of the GFMD process beginning January 2013. In the afternoon of 16 May, the outcomes of various deliberations were reported to all delegates by the Roundtable General Rapporteurs and the Special Session rapporteurs, followed by comments from the SRSG, Mr. Sutherland. At the closing plenary session, Ambassador Åkerman Börje delivered her conclusions on behalf of the Swedish Chair of the Global Forum. She then handed over the GFMD Chairmanship plaque to Ms. Esen Altug, representing incoming GFMD Chair Turkey. The latter gave a statement on behalf of the Government of Turkey, expressing appreciation to Sweden for its excellent stewardship of the GFMD process, and enjoining all delegates to support the Turkish Chairmanship. In closing the 7th GFMD Forum Meeting, Minister Billström and Minister Engström thanked all delegates for their active participation and affirmed Sweden’s commitment to the Global Forum and the inclusion of migration in the post 2015 development agenda. Federacion Zacatecana continues its mission to help the economic and social development of communities in the state of Zacatecas, which together with the support of Zacatecas migrants in the United States have continued on the path of growth through the productive projects. So far this 2014 AC Zacatecana Federation is working on the development of more and new production projects in the 2×1 Program for Migrants, which arise from the concern of migrants benefit their families and their communities. Currently is working FEDZAC resource management to drive these projects amounting to more than 4 million in Federal and State participation in government, which is expected to achieve the consolidation of at least 7 new entrepreneurial projects at various points the state of Zacatecas. With the above FEDZAC reaffirms its commitment as an ally of migrants in both Mexico and the United States, so they can jump-start the infrastructure that allows them to generate productive jobs and sources in the region, and achieve new development paths to Zacatecas. FEDZAC hereby extends an invitation for people interested in starting a business and start a new productive enterprise to our offices where we will help you start your project and start with the steps for obtaining resource approaches 2×1 Program . FEDZAC also offers other business support services through which aim to ensure the proper functioning and sustainability of each project begins with us. 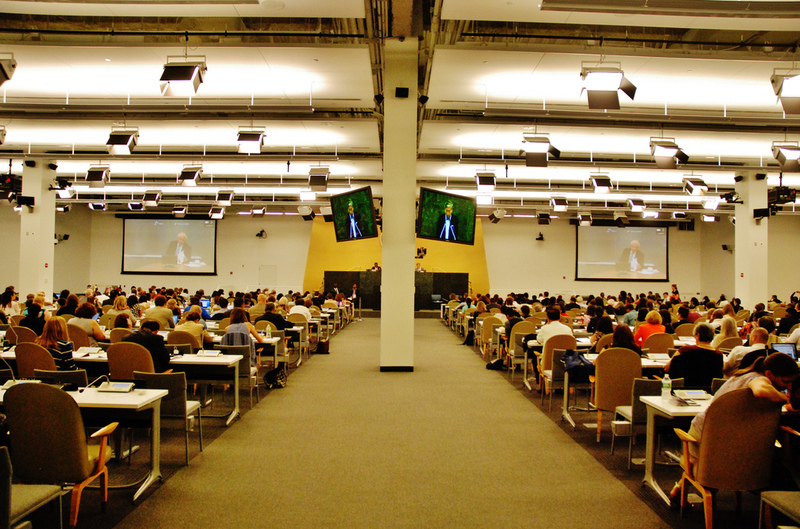 For only the second time ever, United Nations’ Member States organized a High-level Dialogue on International Migration and Development (HLD) on 3 and 4 October 2013. Global civil society invited governments to commit to five years of collaboration on a set of key priorities on international migration and development, including addressing questions like how to regulate private agencies that recruit, place and often abuse foreign workers, how to better respond to boat people and other migrants seriously hurt or traumatized in migration journeys -many at the hands of merciless human traffickers, smugglers and other criminals, how to set and achieve global goals for development that provide countries and people with decent work at home and opportunities to migrate safely, legally and affordably, how to build and strengthen rights-based systems for legal labour migration and decent working and living conditions, integration and options for citizenship in countries of destination, and how to further promote the positive engagement of migrants and diaspora communities in the countries to and from which they have migrated. Although no firm commitments came out of the HLD, global civil society was struck by the enormous convergence among many governments, international organizations, and civil society groups around a set of key priorities that must be urgently addressed. 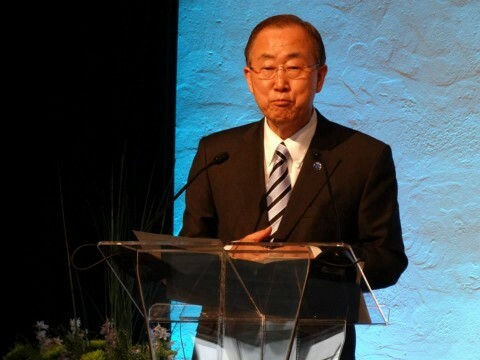 In particular, civil society was struck by the great number of similarities and complementarities existing between Civil Society’s 5-Year-Action Plan and the UN Secretary General Ban Ki-moons’ “8 point action agenda” (Available Here), Peter Sutherland’s 10 points (Available Here) and IOM’s 6 points (Available Here), as well as the Mexican-facilitated milestone Declaration that UN Member States adopted unanimously at the HLD (Available Here). Adding specific references, targets and indicators regarding migration and diaspora in the post-2015 development agenda when the current “Millennium Development Goals” expire. 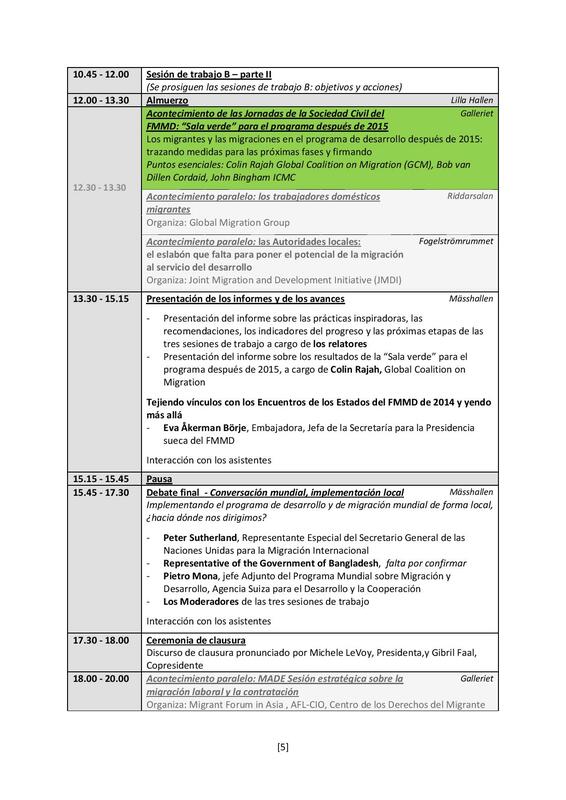 Collecting and advancing existing principles and practices in an organized operational framework for providing protection and assistance to migrants in crises, beginning with conflict and disaster situations, but also looking at migrant victims of trauma and violence in transit. Reforming the migrant worker recruitment industry. Civil society noted repeated references by states at the HLD to the importance of this issue.Promoting the ratification and effective implementation of the new ILO Domestic Workers Convention (C 189). Addressing the needs of children in the context of migration, in particular the plight of unaccompanied children, and structuring alternatives to the detention of children. The GFMD Civil Society Coordinating Office prepared a short matrix presenting that convergence. 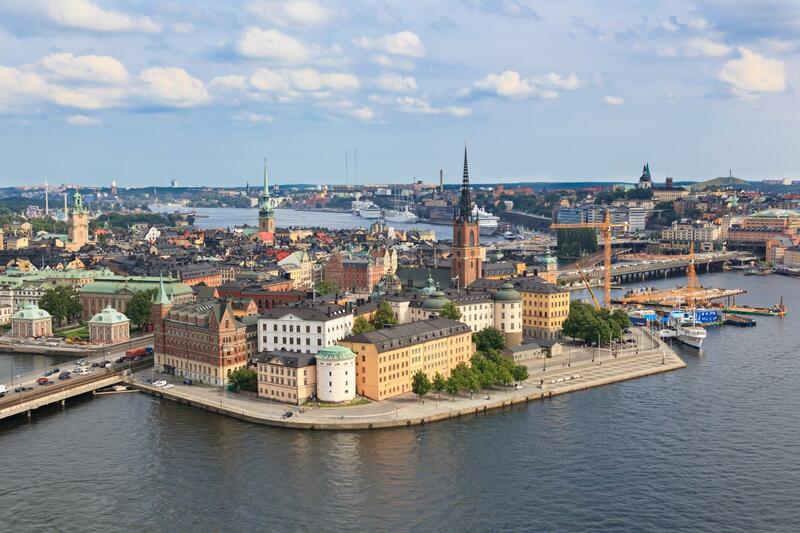 The GFMD Civil Society Days will be held on 12 – 13 May at the Münchenbryggeriet Conference Centre in Stockholm, Sweden. The Common Space with Governments will be held at the same venue on 14 May, and the GFMD Government Days will take place at the same location on 15-16 May. Global civil society embraces the 2014 GFMD as the first global opportunity to capitalize on the outcomes of the 2013 High Level Dialogue on Migration and Development and to drive forward civil society Five Year Action Agenda. 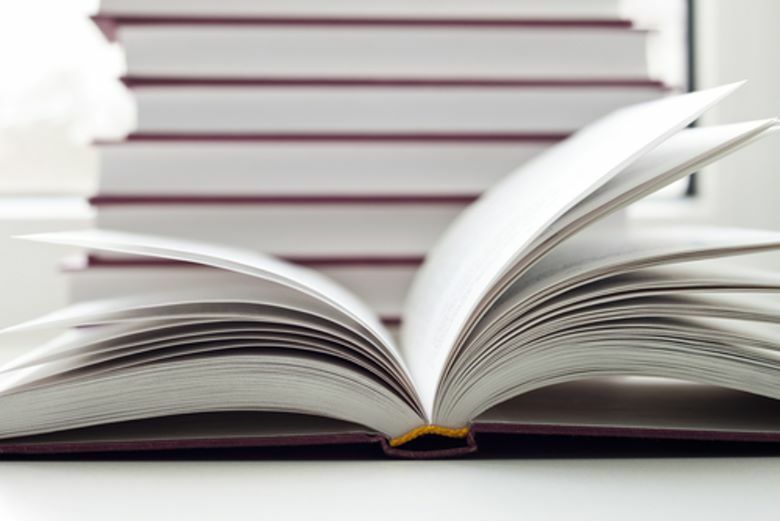 Apart from the programme, which you will have to download separately from the list above, we also have a .zip file that contains all the relevant conference documents. 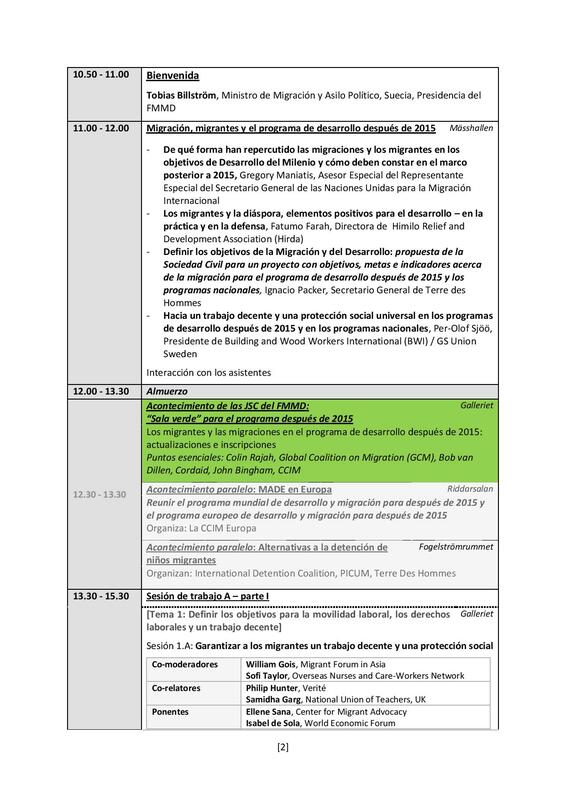 As the first major event after the 2013 United Nations High-level Dialogue on International Migration and Development (HLD), the GFMD Civil Society Days will once again bring together more than 200 migrant and civil society leaders from all over the world. At the HLD, global civil society was struck by the enormous convergence among many governments, international organizations, and civil society groups around a set of key priorities that must urgently be addressed – including ensuring migration and migrants’ rightful place on the post-2015 agenda, protecting migrants in crisis and transit, reforming the migrant worker recruitment industry, and more. 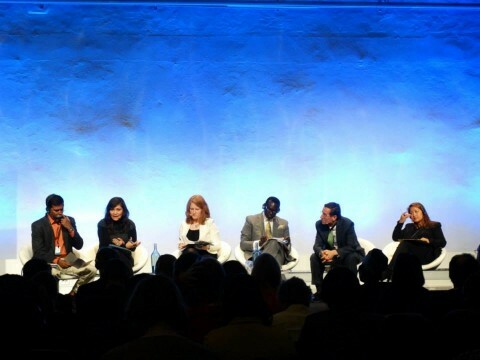 Civil society worldwide can seize the 2014 GFMD as the first global opportunity to capitalize on this convergence, drive forward civil society’s 5-year 8-point Action Plan, and urge governments to commit to further dialogue, practical cooperation and change. 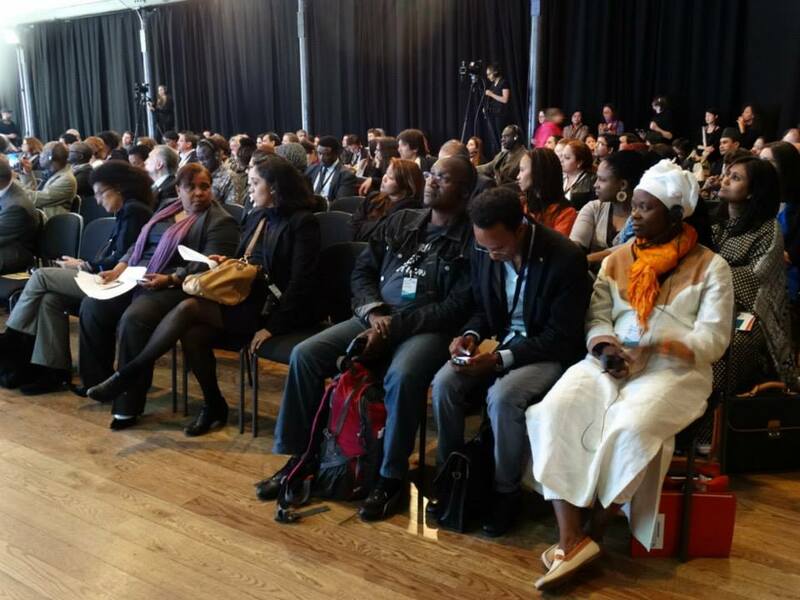 Out of 780 applicants, 270 have been selected to participate as civil society delegates in 2014 Global Forum on Migration and Development (GFMD). Applicants were notified of their selection the last week of March. This selection was performed by an International Steering Committee (ISC), comprised of civil society leaders from every sector of civil society and region around the world. Like in previous years, every delegate must make his or her own travel, accommodation and visa arrangements! Participants who applied for funding support to participate in the GFMD Civil Society Days, will receive an email within a week of their acceptance notice, indicating if any of the very limited such funding will be available them. Building upon the widening cooperation and convergence among hundreds of civil society groups all over the world the past years, a global Migration And DEvelopment (MADE) network for and by civil society will be launched at the Global Forum on Migration and Development (GFMD) Civil Society Days in Stockholm, on 12-13 May 2014. With more people than ever before moving to other countries, it is ever more important for civil society to advocate for policies and practices that ensure the well-being and human dignity of the more than 232 million migrants, diaspora and families, and facilitate their contributions to the development of the communities they live in and come from. Prompted by the need to consistently and collectively step-up civil society’s global advocacy efforts and cooperation with governments, MADE aims to connect and strengthen regional networks and thematic groups of civil society around the world. It will do so by working closely together with existing civil society networks, such as the Global Coalition on Migration, Migrants Rights International, the PanAfrican Network in Defense of Migrants’ Rights, the NGO Committee on Migration, and other networks active in Europe and beyond, with a goal of increasing the capacity of organizations and networks to cooperate and speak in unified voices. At the same time, the MADE network is also intended to be able to respond to current events, crises and opportunities. Evolving out of civil society’s “self” organizing for the GFMD and HLD since 2011, and coordinated by the International Catholic Migration Commission (ICMC), the MADE network will work directly with partners around the world, under the guidance of an International Steering Committee comprised of development and human rights NGOs, diaspora and labour organizations, academia and the private sector. The network will be open to civil society organizations worldwide. Benefitting from initial funding support for three years from the European Commission, and still seeking co-funding, activities of the MADE network include regional and thematic migration and development conferences before, during and after the GFMD, joint global and regional MADE newsletters, advocacy reports and campaigns, and online and offline exchange of practices and experiences. 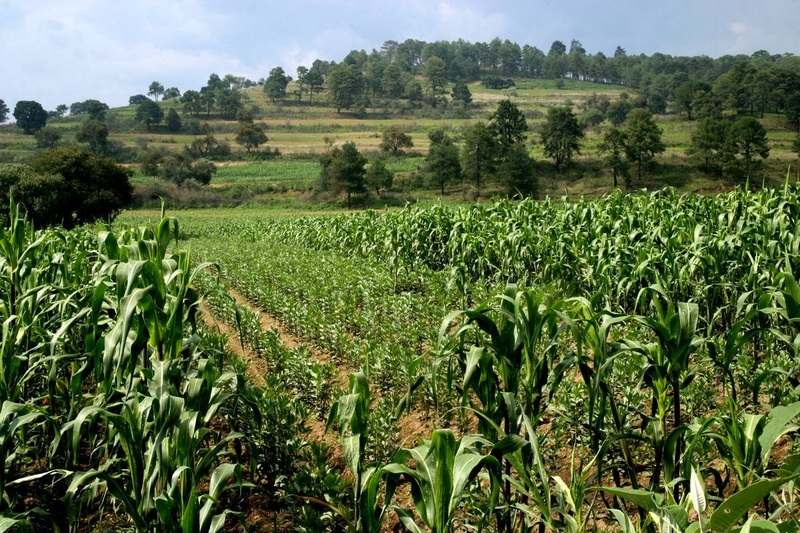 A small pilot seed fund will also be available, to allow organizations to implement advocacy and policy actions on the ground in Africa, Asia, Latin America and the Caribbean. Members of the MADE network will also come together annually during the civil society program of the GFMD. 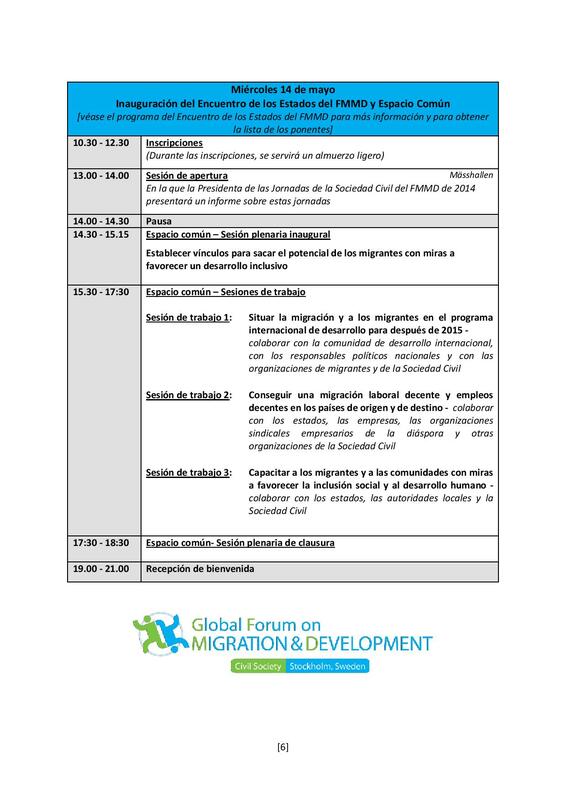 Efrain Jimenez , Executive Director of FEDZAC has been pleased to receive the invitation to moderate two work sessions in Global Forum on Migration and Development (GFMD ) to be held on 12, 13 and 14 May at the Münchenbryggeriet Conference Center in Stockholm, Sweden . 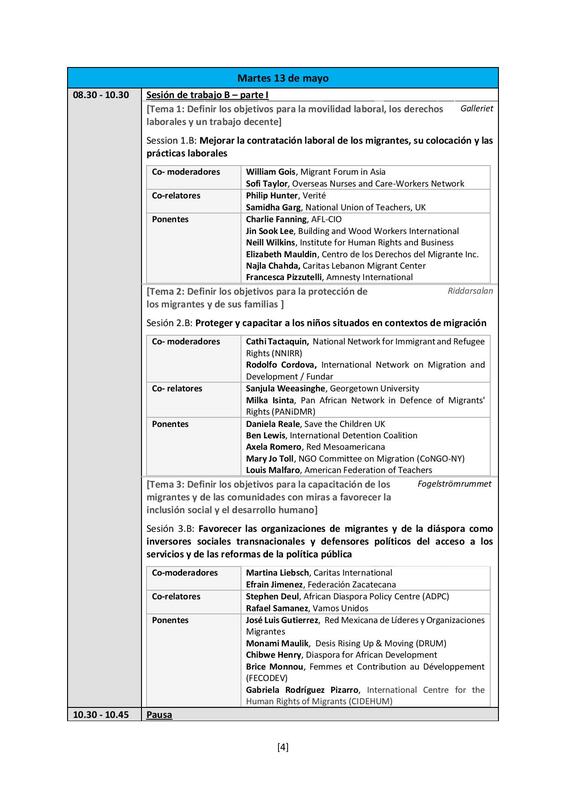 This invitation is only extended to highlight the organizations and leaders of civil society , networks and international on migration and global development committees, so it is a great privilege to be considered for moderate work not one but two desks . The program this year focuses on ” Shaping of Migration and Development Goals : Global Motion Exchange Fund.” The theme reflects the ownership of the civil society to translate the outputs of the High-level Dialogue on International Migration and Development plan and eel 5 and 8 points derived therefrom , into concrete goals, targets and indicators , aiming at implementing in the local context , best practices and changing background. Invite today speaks of the importance and significance of FEDZAC work with civil society , not only locally , but on the international scene is received . Since the contribution through the work done is to migrant communities in Mexico , has succeeded in improving the economic and social situation in their regions. Allowing the generation of jobs and development to families and communities. In line with the September 2006 report from the UN-GA High Level Dialogue on Migration and Development (HLD) and the GFMD Operating Modalities endorsed in Brussels in 2007, the GFMD is a voluntary, informal, non-binding and government-led process open to all States Members and Observers of the United Nations, to advance understanding and cooperation on the mutually reinforcing relationship between migration and development and to foster practical and action-oriented outcomes. The GFMD process brings together expertise from all regions and countries at all stages of economic, social and political development. Policy-makers from a wide range of government agencies participate, including from Ministries and Departments of Immigration, Development, Labour, Foreign Affairs, Gender Equality, Home Affairs, Justice, Interior, Integration and Nationals Abroad. 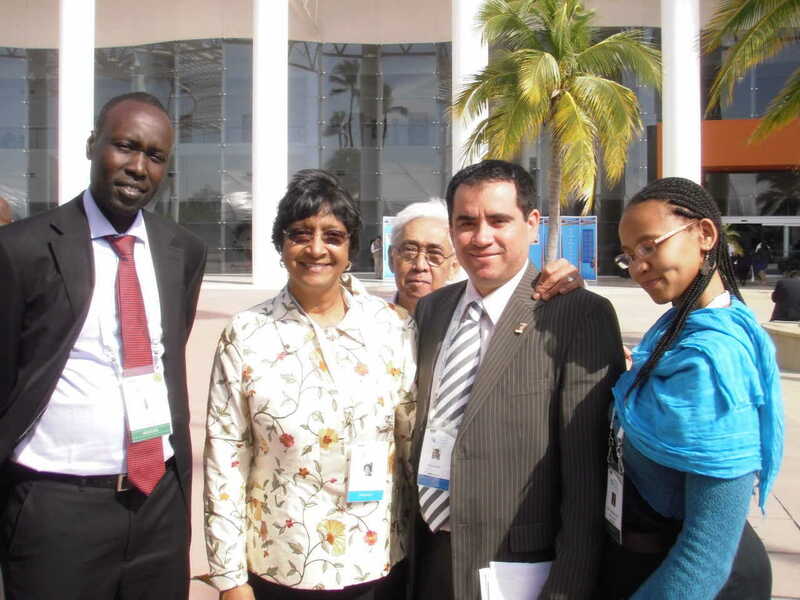 Since its inception, the GFMD has operated on the basis of a unique participative working method, involving governments and policy makers from a varied background. 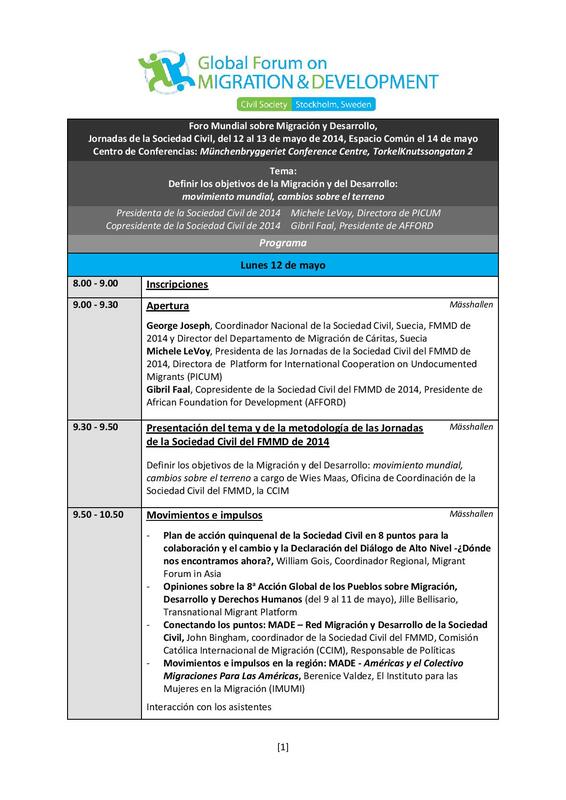 UN and other international agencies, including those that make up the Global Migration Group , as well as academia and civil society organizations, as appropriate and desired by governments are involved in the process. The Forum has also engaged civil society representatives by inviting them to hold parallel meetings and share their deliberations with states. The aim is to include the voices and expertise of academia, NGOs, trade unions, the private sector, migrants and diaspora representatives in the Forum. Since 2007, the government and civil society engagement has expanded and deepened incrementally each year — starting with a single Civil Society Day in Brussels and advancing to two Civil Society Days thereafter. The first government-CS interface was held in Manila in 2008, expanded in Athens in 2009, and further developed in Puerto Vallarta in 2010 into a “common space”, bringing a big CS delegation to the opening plenary session of the governments to participate in direct dialogue with the latter on issues of common concern. 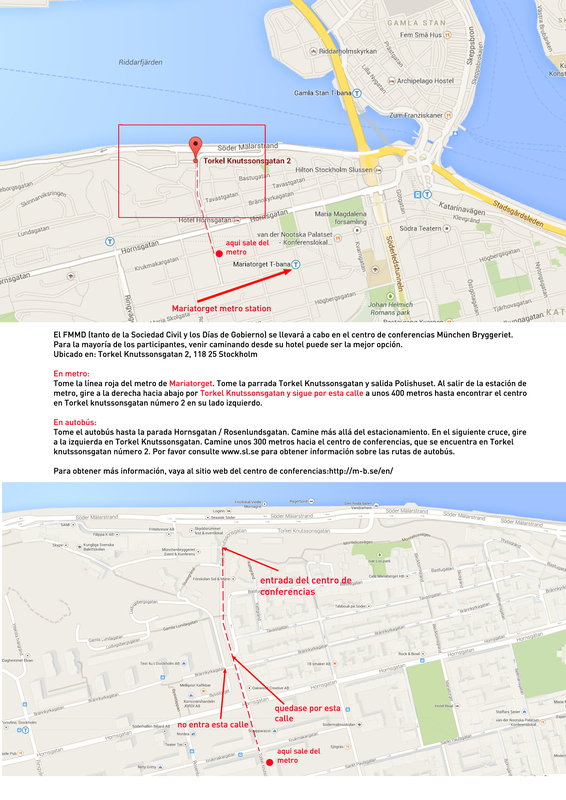 Material: Do you know what to do in case of deportation? Here is a manual developed by the Appleseed Foundation, for whose realization was attended by Efraín Jiménez, president of FEDZAC.